If one quality characterizes our wars today, it's their endurance. They never seem to end. Though war itself may not be an American inevitability, these days many factors combine to make constant war an American near certainty. Put metaphorically, our nation's pursuit of war taps so many wellsprings of our behavior that a concerted effort to cap it would dwarf BP's efforts in the Gulf of Mexico. Our political leaders, the media, and the military interpret enduring war as a measure of our national fitness, our global power, our grit in the face of eternal danger, and our seriousness. A desire to de-escalate and withdraw, on the other hand, is invariably seen as cut-and-run appeasement and discounted as weakness. 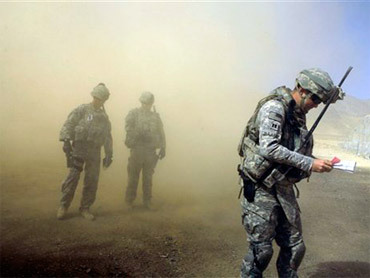 Withdrawal options are, in a pet phrase of Washington elites, invariably "off the table" when global policy is at stake, as was true during the Obama administration's full-scale reconsideration of the Afghan war in the fall of 2009. Viewed in this light, the president's ultimate decision to surge in Afghanistan was not only predictable, but the only course considered suitable for an American war leader. Rather than the tough choice, it was the path of least resistance. Why do our elites so readily and regularly give war, not peace, a chance? What exactly are the wellsprings of Washington's (and America's) behavior when it comes to war and preparations for more of the same? 1. We wage war because we think we're good at it -- and because, at a gut level, we've come to believe that American wars can bring good to others (hence our feel-good names for them, like Operations Enduring Freedom and Iraqi Freedom). Most Americans are not only convinced we have the best troops, the best training, and the most advanced weapons, but also the purest motives. Unlike the bad guys and the barbarians out there in the global marketplace of death, our warriors and warfighters are seen as gift-givers and freedom-bringers, not as death-dealers and resource-exploiters. Our illusions about the military we "support" serve as catalyst for, and apology for, the persistent war-making we condone. 2. We wage war because we've already devoted so many of our resources to it. It's what we're most prepared to do. More than half of discretionary federal spending goes to fund our military and its war making or war preparations. The military-industrial complex is a well-oiled, extremely profitable machine and the armed forces, our favorite child, the one we've lavished the most resources and praise upon. It's natural to give your favorite child free rein. 3. We've managed to isolate war's physical and emotional costs, leaving them on the shoulders of a tiny minority of Americans. By eliminating the draft and relying ever more on for-profit private military contractors, we've made war a distant abstraction for most Americans, who can choose to consume it as spectacle or simply tune it out as so much background noise. 4. While war and its costs have, to date, been kept at arm's length, American society has been militarizing fast. Our media outlets, intelligence agencies, politicians, foreign policy establishment, and "homeland security" bureaucracy are so intertwined with military priorities and agendas as to be inseparable from them. In militarized America, griping about soft-hearted tactics or the outspokenness of a certain general may be tolerated, but forceful criticism of our military or our wars is still treated as deviant and "un-American." 5. Our profligate, high-tech approach to war, including those Predator and Reaper drones armed with Hellfire missiles, has served to limit American casualties -- and so has limited the anger over, and harsh questioning of, our wars that might go with them. While the U.S. has had more than 1,000 troops killed in Afghanistan, over a similar period in Vietnam we lost more than 58,000 troops. Improved medical evacuation and trauma care, greater reliance on standoff precision weaponry and similar "force multipliers," stronger emphasis on "force protection" within American military units: all these and more have helped tamp down concern about the immeasurable and soaring costs of our wars. 6. As we incessantly develop those force-multiplying weapons to give us our "edge" (though never an edge that leads to victory), it's hardly surprising that the U.S. has come to dominate, if not quite monopolize, the global arms trade. In these years, as American jobs were outsourced or simply disappeared in the Great Recession, armaments have been one of our few growth industries. Endless war has proven endlessly profitable -- not perhaps for all of us, but certainly for those in the business of war. 7. And don't forget the seductive power of beyond-worse-case, doomsday scenarios, of the prophecies of pundits and so-called experts, who regularly tell us that, bad as our wars may be, doing anything to end them would be far worse. A typical scenario goes like this: If we withdraw from Afghanistan, the government of Hamid Karzai will collapse, the Taliban will surge to victory, al-Qaeda will pour into Afghan safe havens, and Pakistan will be further destabilized, its atomic bombs falling into the hands of terrorists out to destroy Peoria and Orlando. The truth is that no one really knows what would happen if the U.S. disengaged from Afghanistan. But we do know what's happening now, with us fully engaged: we're pursuing a war that's costing us nearly $7 billion a month that we're not winning (and that's arguably unwinnable), a war that may be increasing the chances of another 9/11, rather than decreasing them. 1. Let's reject the idea that war is either admirable or good -- and in the process, remind ourselves that others often see us as "the foreign fighters" and profligate war consumers who kill innocents (despite our efforts to apply deadly force in surgically precise ways reflecting "courageous restraint"). 2. Let's cut defense spending now, and reduce the global "mission" that goes with it. Set a reasonable goal -- a 6-8% reduction annually for the next 10 years, until levels of defense spending are at least back to where they were before 9/11 -- and then stick to it. 3. Let's stop privatizing war. Creating ever more profitable incentives for war was always a ludicrous idea. It's time to make war a non-profit, last-resort activity. And let's revive national service (including elective military service) for all young adults. What we need is a revived civilian conservation corps, not a new civilian "expeditionary" force. 4. Let's reverse the militarization of so many dimensions of our society. To cite one example, it's time to empower truly independent (non-embedded) journalists to cover our wars, and stop relying on retired generals and admirals who led our previous wars to be our media guides. Men who are beholden to their former service branch or the current defense contractor who employs them can hardly be trusted to be critical and unbiased guides to future conflicts. 5. Let's recognize that expensive high-tech weapons systems are not war-winners. They've kept us in the game without yielding decisive results -- unless you measure "results" in terms of cost overruns and burgeoning federal budget deficits. 6. Let's retool our economy and reinvest our money, moving it out of the military-industrial complex and into strengthening our anemic system of mass transit, our crumbling infrastructure, and alternative energy technology. We need high-speed rail, safer roads and bridges, and more wind turbines, not more overpriced jet fighters. 7. Finally, let's banish nightmare scenarios from our minds. The world is scary enough without forever imagining smoking guns morphing into mushroom clouds. There you have it: my seven "caps" to contain our gushing support for permanent war. No one said it would be easy. Just ask BP how easy it is to cap one out-of-control gusher. Nonetheless, if we as a society aren't willing to work hard for actual change -- indeed, to demand it -- we'll be on that military escalatory curve until we implode. And that way madness lies.